COSTCO: Stop taking babies from their mothers! Repeat investigations by DxE have found horrifying conditions at Costco farms. Ask the CEO of Costco to end the exploitation of animals like Madison. A DxE open rescue team entered a massive North American breeding farm and found dozens of dead and rotting piglets. 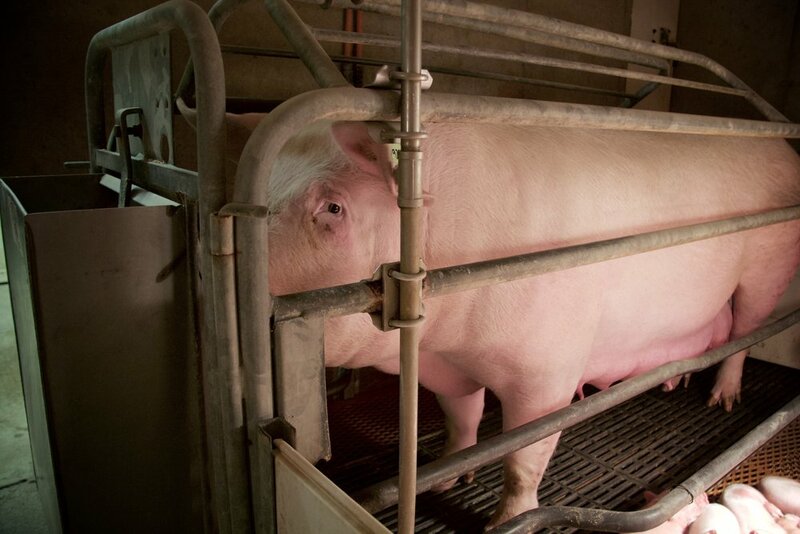 Mothers were forced to live endless, nightmarish existences in crates as small as their own bodies. Their babies were taken at just 17 days, months before weaning, so their mothers could be forced to give birth again. But Madison was saved. Madison’s mother was forcibly impregnated, then shoved into a gestation crate where she would not be able to turn around for four months. 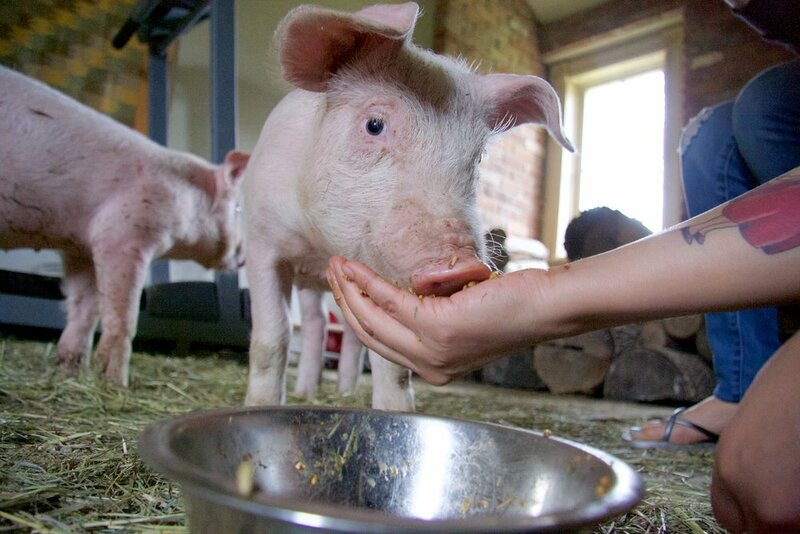 Madison lived with 10 siblings in a tiny farrowing crate for 17 days. Then, she was taken into a filthy pen where she would be forced to fight for food, water, and space. At six months, Madison would be shoved into a transportation truck jammed shoulder to shoulder with juvenile pigs. But Madison was the one in a million who would be saved. From bubble baths to holiday feasts, animals on farms love many of the same things we love. In every way that matters, they are just like us. Madison samples some of this season's finest running gear. Like all animals, Madison was a piglet with feelings and a unique personality. She loves to play, bounce up and down, twist, and run. Madison and other animals exploited in farms are highly social animals, yet their desires for friendship are ignored. Now, Madison can have adventures with her best friend (Ooby the sheep), including breaking into the food shed to steal horse treats! At six months, Madison would be shoved into a transportation truck jammed shoulder to shoulder with juvenile pigs. She never had a moment of freedom in her life. But today, Madison grunts happily as she moves about as she wishes at a sanctuary. Madison bonds with Jenny McQueen - her DxE open rescuer and first human friend. Madison eats out of the hand of a caretaker, a person she has slowly grown to trust. Fruits are some of Madison's favourite treats. Every family has a weird nosy uncle. At Madison's newly adopted family - it's Buster the dog. Madison bonding with activist Alex Bez. Playing "Peekaboo" with a little help from Madison's ears. Taking a post-meal afternoon nap. Thanks to Open Rescue activists and emergency veterinary care, Madison is on her road to a full recovery. But there are countless more piglets like Madison who need help. Take action now! Veterinary care, equipment, and campaigns are expensive. We can only save animals like Madison with your help!